Have you started on your Easter tree yet? I’ve gotten some emails from Waldorf moms asking for ideas on how to celebrate Easter with the kids. 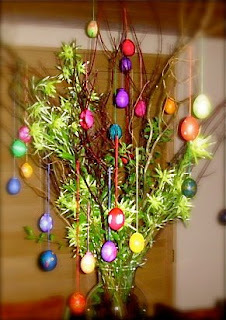 The basic theme of Easter is renewal and new life, so I made sure to put greens with the branches I found. This is a shot of my very first Easter tree. I put this up several years ago while on vacation. The children and I had lots of fun decorating the eggs. I used both food coloring and natural (from vegetables like beets, onions)coloring. I experimented with beeswax. I also bought those easter egg decorating kits and just used whatever. Then I crocheted little caps to cover the hole on the eggs, though you can tie the string on a bit of toothpick and insert that through the hole. (For the newbies, the hole is there after you’ve blown out the egg.) There’s still time left to do this. It doesn’t have to be so elaborate. You can also do it slowly through the 40 days of Easter so that it can build up through the days and the celebration isn’t focused on just the egg hunt and everyone can feel that Easter is really more of a season. I usually start the day by gathering around the table and lighting a candle then telling an Easter story. After the story, the children can go and hunt for eggs–real eggs, of course, also lovingly prepared (though this time, in secret)and hidden in the garden.